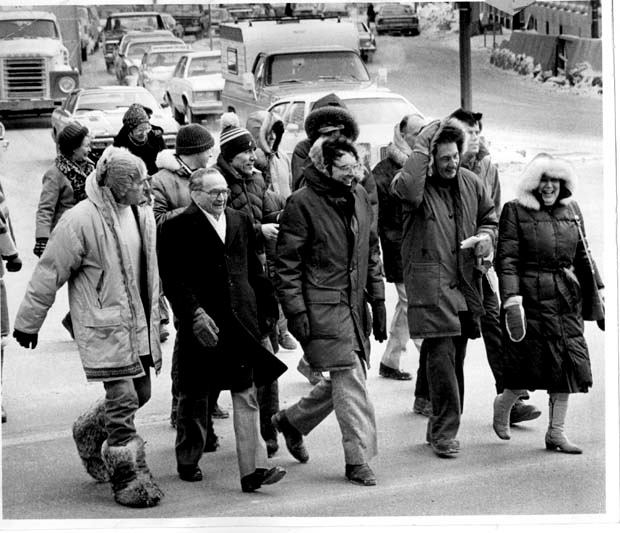 Nearly forty years ago, in March 1979, Winnipeg city councillor Joe Zuken led a band of a dozen or so pedestrians in what is likely to have been city’s most celebrated act of jaywalking. 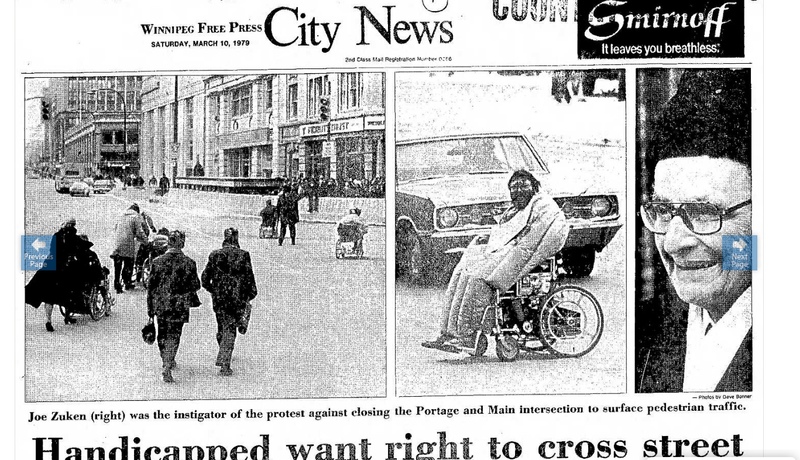 The day before, city council’s ban on pedestrian crossing of Portage and Main had come into effect. Zuken was making good on his promise to defy the ban by leading supporters on a short but windy trek that saw them complete a circuit, walking from each corner to the next. Photo: Front row, left to right – John Robertson, Joe Zuken, Grant Wichenko, Leonard Marco, Evelyn Shapiro. Behnd Zuken: Jim Maloway. Courtesy of Winnipeg Tribune Photo Collection, University of Manitoba. March , 1979. Photographs of the day constitute a stern reminder that Portage and Main’s reputation for being a cold and windy place is not undeserved. Most of Zuken’s supporters are wearing bulky parkas and have their heads tucked into fur-lined hoods and toques. Only Zuken, presumably accustomed to the cold by his years of sailing against the political wind, stands out in this regard. Hatless, he determinedly leads his band clad in an overcoat. No one was arrested, no one was charged for this act of civil disobedience. The attorney general of the day said he did not wish to give the protest any additional publicity. What Zuken and his supporters were protesting was not simply a ban on surface crossing—although there was plenty to protest about that ban, including the shameful lack of attention that had been paid to the needs of people with disabilities. The true object of Zuken’s protest was Winnipeg city council’s longstanding inability to resist the siren song of the property developer. The ban on pedestrian crossing was part of a much larger exercise in corporate welfare, in which the city provided extensive support to a multinational development company, despite the fact that the developer continued to constantly change the nature of its proposed development. In the process pedestrians were reconceived as potential consumers. Banned from the public pathway, they were to be funneled through developer-owned underground shopping malls. The closure of Portage and Main is wrapped up in the history of the building that looms over the southwest corner of the intersection. In 1971 the Trizec Corporation, a high-profile development company that brought together British, U.S., and Canadian money announced that along with the Bank of Nova Scotia, it was interested in developing a bank building, an apartment tower, a hotel, and a shopping mall on the site where the city was planning to construct an underground parking lot. Zuken opposed the deal from the outset, pointing out that the city would be obliged to assemble the land and build the parking lot and the building foundation without any guarantee that Trizec would, in the end, build anything. By 1975, the City had bought and cleared the land still without receiving any guarantee as to what was to be built. Trizec then threatened to drop out of the project if the city did not agree an underground pedestrian concourse (and pay 80 per cent of the construction costs and 100 per cent of the maintenance costs of concourse) and ban surface crossing of the intersection (to force people into the concourse). By this point, opposition to the project was mounting: the 1976 vote to ban surface crossing passed city council by a single vote. Two years later Trizec revealed its final plans: gone were the hotel and the second office tower (for which the city had built foundations) and the shopping mall was scaled back. Most of the land that the city accumulated has sat empty for the past forty years: part of it was the bleakest of urban “plazas” imaginable, while the rest of the surface area was covered with the flat roofing of the mall below. It is such a dead no-go zone that it is doubtful many Winnipeggers even noticed it. The development’s failure to find a place in the city’s life—a significant failure for any project of so-called ‘urban re-vitalization’—is that few Winnipeggers could identify the name of the 31-storey high-rise at the heart of the story. Given the project’s controversy it was known informally for many years as the Trizec Building. Its formal name was the Commodity Exchange Tower, since it was the home of the Winnipeg Commodity Exchange. But since 2008 it has simply been known as 360 Main Street. The pedestrian barriers at Portage and Main are a symbol of a failed corporate development model for the city. Removing them will certainly enliven the downtown by putting more people on the streets and serve as a sign of greater openness. But symbols can be diversions: the real questions facing too many Winnipeggers is not where they can cross the street, but where they will lay their heads. On this score city council still finds the call of the developer more attractive that of community organizations. The city’s decision not to grant tax increment financing to Gas the Station redevelopment in Osborne Village obliged that organization to drop its co-op housing component. IKEA, on the other hand, not surprisingly had no problem getting a tax financing break from the city for its “Seasons of Tuxedo” project. Doug Smith is the author of Joe Zuken: Citizen and Socialist. (Toronto: James Lorimer and Company. 1990). Joe Zuken (1912 – 1986) served for 42 years as school trustee and City Counsellor in Winnipeg. CCPA Manitoba is proud to be supported in part by the Joseph Zuken Memorial Fund and hosts the Joseph Zuken Activist Awards. ← Should the City of Winnipeg subsidize high-end housing downtown?